Throughout history, the oceans have been important to people around the world as a means of transport and enhancing mobility. Connecting the archipelagic regions of ASEAN requires efficient and reliable shipping routes to enhance intra-ASEAN connectivity. The rivers and seas are also important for serving shorter trips like ferry services and recreational cruises. Today, the latter has recently experienced a tremendous boom and represents an increasingly lucrative source of tourist income. 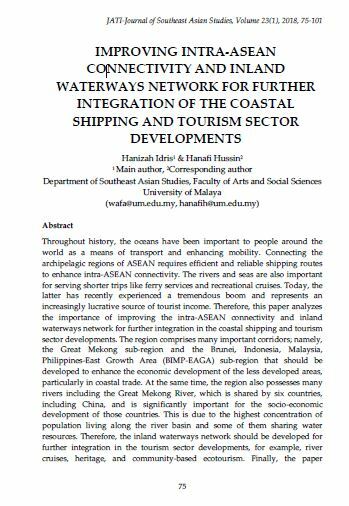 Therefore, this paper analyzes the importance of improving the intra-ASEAN connectivity and inland waterways network for further integration in the coastal shipping and tourism sector developments. The region comprises many important corridors; namely, the Great Mekong sub-region and the Brunei, Indonesia, Malaysia, Philippines-East Growth Area (BIMP-EAGA) sub-region that should be developed to enhance the economic development of the less developed areas, particularly in coastal trade. At the same time, the region also possesses many rivers including the Great Mekong River, which is shared by six countries, including China, and is significantly important for the socio-economic development of those countries. This is due to the highest concentration of population living along the river basin and some of them sharing water resources. Therefore, the inland waterways network should be developed for further integration in the tourism sector developments, for example, river cruises, heritage, and community-based ecotourism. Finally, the paper identifies the key challenges faced by the region in improving the intra-ASEAN connectivity as well as managing its inland waterways network, particularly in coastal trade and tourism activities, and how it can be integrated regionally. IDRIS, Hanizah; HUSSIN, Hanafi. IMPROVING INTRA-ASEAN CONNECTIVITY AND INLAND WATERWAYS NETWORK FOR FURTHER INTEGRATION OF THE COASTAL SHIPPING AND TOURISM SECTOR DEVELOPMENTS. JATI - JOURNAL OF SOUTHEAST ASIAN STUDIES, [S.l. ], v. 23, n. 1, p. 75-101, june 2018. ISSN 2600-8653. Available at: <https://jati.um.edu.my/article/view/12188>. Date accessed: 20 apr. 2019. doi: https://doi.org/10.22452/jati.vol23no1.5.